Ganymedes is a revered, handsome Trojan prince. His beauty has not gone unnoticed by the gods. The day of his coming of age parade, Ganymedes is abducted by Apollon, the sun god. Ganymedes awakens in a foreign place, surrounded by pure-white flowers and an endless, star-filled sky. Apollon reappears and informs Ganymedes that he’s imprisoned in the Garden of the Gods. For what purpose is he being kept there? 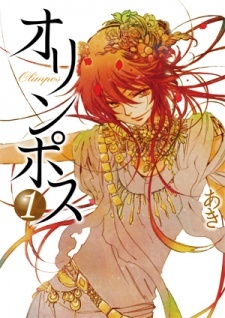 Olimpos was published in English as Olympos by Yen Press on June 26, 2012. This manga would catch people's attention with its beautiful art. It's very consistent and gorgeous. Hands down, it's definitely a 9, if not 10. I love the way the Gods are drawn, especially Zeus. For the story, indeed if it's your first time to read sensei's work, then you'd be confuse. It's kinda deep, you see. The questions that arise from the story is quite challenging to understand. Sometimes you can't understand what they are talking about. You have to really concentrate to get what's happening. I also feel that the manga lacks a proper ending. Maybe it's because it's my first time reading sensei's work or maybe it's just the way the manga is. But the ending isn't satisfying. Though it's only two volumes, I feel that I understand the characters and they were developed quite well. But I would like to see more of the first guy who suddenly appeared. It would be really interesting. Over all, it's a great manga for those who love Greek Mythology and deep psychological thinking. But the art is really good that I don't think you'd mind reading the manga just for the art. Well no one wrote a review yet, obviously as i am the only one so far. This is also my first review, i just thought i should mention that. Hmm well to tell you the truth at times when i was reading Olimpos i was wondering if perhaps i was reading it wrong. Maybe i was. But there were some confusing parts with dialouge and frankly, with what the heck was going on. Well you can figure out the basics, that its about Ganymedes who was stolen away to a Minature Garden by Apollo. Where then Apollo visits him often to converse in ambigious conversations about what is true and how Ganymedes can escape. There are a few other greek gods added as characters as well. But besides a few misunderstandings here and there, the story was interesting (if you can wait to the end to really get the idea of its meaning). The artwork overall was very good, characters were detailed, the setting was a little minimal, but what the setting lacks in detail the story doesn't. XD There is suttle humor and moments that leave you curious to read more, so its not bland. I have mixed feelings about this manga though. It wasn't that it was horrible and its not really to the point that i could of cared not to read it, but as Aki said in a author note at the end "its light reading". So if your looking for a manga that still makes you think, has beautiful characters, and is light/quick reading, Olimpos is a good choice. Plus, if you liked Olimpos, Aki has other mangas she wrote. Aki did a very, very good job on this series. However, I wouldn't recommend Olimpos to readers who are new to Aki's works. Pros: The art is awesome-sauce [besides the background and character design problem]. So I have to say, Olimpos is the most detailed and proportionally accurate manga I've ever read. So if you're the type of person who obsesses over art in a manga, this is for you. Overall: Confusing, strange, detailed, beautiful, and a work of art. This can be either a light reading as Aki had suggested, or it can be pretty serious. Just keep in mind that all the scenes and dialogs aren't there for no reason, so pay attention to everything while reading if you want to actually understand the manga. Ok, normally I do not write reviews and I do not believe in them either. I find them plain useless. Still, I need to talk about this story and so I shall write the third review. The story really deserves some attention. Honestly, it is not for everyone. It’s mainly base around theology and existentialism, and also some interesting eastern philosophies about the creation of the world and the balance of things. So, yeah, if you are not interested in the subject you will find the plot mediocre at best. If you have some basic knowledge or even the tendency to be curious about some things, I believe you will get mind-blown. The impact I can compare this piece of art to is the impact I got with Ergo Proxy and all the philosophy there. The topics vary: immortality, creation, knowledge – all you can think of among these fields. I found the story very intriguing to the point I decided to actually write I review. The characters are also interesting. Sadly not all of them. But at least the main characters deserve some attention and are well-developed based on their traits. Apollo is the one who is the most contradicting but if we stick to the nature of the actual god, he is perfect. I liked a great deal the taste of order in the chaotic way of thinking of gods. It is well-balanced between the idea that humans cannot comprehend gods and also that gods cannot comprehend humans. The essence of the whole story is in that balance.